The A4 sedan is the heart of the Audi lineup. 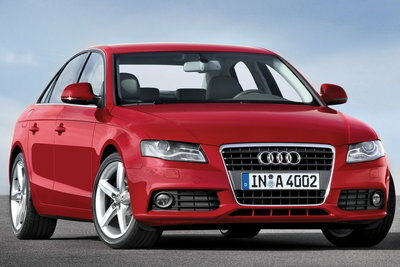 The A4 is available in an impressive number of driveline configurations including 4-cylinder, V6 engines, FWD and AWD. All versions include Audi's decidedly German combination of handsome styling and mechanical prowess. The turbocharged four-cylinder and V6 models offer a lot of performance for the money. A long list of standard equipment includes a leather interior, MMI information interface, and a sunroof. Higher trim levels offer exclusive features like adaptive cruise control and LED headlamps. Sport and S-Line trim packages allow buyers to tailor the A4 to their tastes. As good as the A4 is it competes in what may be the most competitive segment in the whole industry featuring standouts like the BMW 3-series, Infiniti G35 and the Lexus IS, all offering models in the low to mid 30s. The S4 performance model will rejoin the lineup for the 2010 model year. The redesigned A4 Avant is longer by 5 inches and wider by 2 inches. Styling highlights include Audi's single-frame grille, headlamps with LED daytime running lamps, a more aggressive roofline and angular LED tail lamps. A more powerful 2.0L TFSI four-cylinder (211 horsepower, 258 lb-ft torque) becomes the base engine. A 3.2L V6 is also available on sedan models. Entry-level 2.0L models are front-wheel-drive with optional all-wheel-drive. All-wheel-drive is standard on 3.2L models. The S4 performance model skips the 2009 model year.